Our log roll edging comes in various heights to suit all needs; rolls are 2.4m (7ft 10.5 ins) long. They are constructed from log halves to give one straight edge and one scalloped edge, the logs being wired together with galvanised wire to form the roll. The timber used is FSC certified and sustainable, it is then pressure treated for long life before being made into the garden roll product. You can paint or stain it if required to your own specification. The log roll edging material is easily installed in either a straight line or curves. It provides a neat and attractive edging to beds, borders, lawns or paths. These products will allow you to achieve your garden landscaping ideas quickly and easily by forming attractive border edging, path edging or a decorative edge to your raised patio or decking area. Contemporary garden design ideas can be brought to life by using the log roll to create separate areas within the garden especially where level change ideas are involved. Garden patio ideas are considerably extended when log roll is used to create raised beds. This wooden border edging can help to keep your garden trimmer and your flower beds well defined. It is much more attractive and natural looking than either concrete edging or metal lawn edging. The taller rolls are useful for edging raised beds or giving a neat edge to level changes or steps in the garden. However if the height is more than about 250 mm consideration should be given to additional support for the retained soil, and using the log roll as the decorative finish. 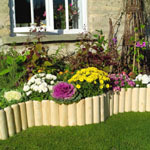 Natural timber log rolls provide an answer to garden border ideas. Used as an edger to garden beds, or as path edging, they will immediately provide a timeless effect. Of the many ideas for small gardens, log rolls provide a simple solution which is easy to install. Patio designs will be enhanced by the use of natural products around the edge. Landscape gardening is made easy both from the garden designs aspect, and from the application. Product size: 15cm high x 240cm long. 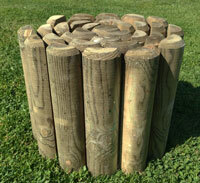 This natural timber log rolls provide an answer to garden border ideas. Used as an edger to garden beds, or as path edging, they will immediately provide a timeless effect. Of the many ideas for small gardens, log rolls provide a simple solution which is easy to install. Patio designs will be enhanced by the use of natural products around the edge. log roll size: 20cm high x 240cm long. Product size: 22.5cm high x 240cm long. Product size: 30cm high x 240cm long.